The Hall of Silence is the silent centre of the Maharishi Smarak. 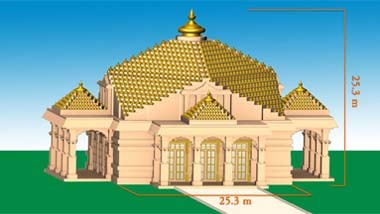 This grand pavilion is being built according to the principles of Maharishi Sthapatya Veda to bring individual life in accord with cosmic life. Standing in the Hall of Silence, visitors will bask in the profound atmosphere of deep spirituality that radiates from the Brahamsthan (centre of silence) of this grand memorial to the eternal wisdom of life. 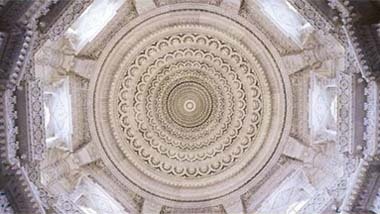 They will be uplifted and inspired by the exquisitely carved marble pillars, the inner circular dome with its marble lotus petals radiating out in delicate repeating patterns, and by the skillfully executed marble panels displaying the most significant themes of Maharishi’s Total Knowledge. Atop the roof, 1008 gold-plated Kalashes will light the sky with radiant brilliance for many miles around, attracting millions of visitors to enjoy the Darshan of Maharishi’s eternal silence. Total height up to the main Kalash will be 25.3 m = 83 ft, which exactly corresponds to the outer dimension of the main Hall in an auspicious 1:1 ratio. 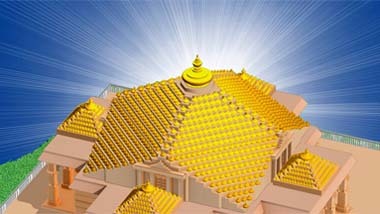 There will be 1008 gold plated Kalashes on the stepped roof. Their golden brillance will fill the surrounding area for many miles around, attracting millions of visitors for a taste of bliss and Darshan of Maharishi's eternal silence. 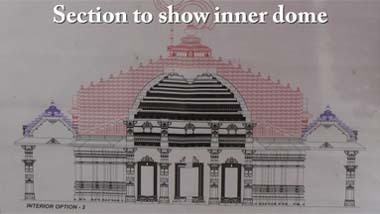 The inner dome of the Smarak (Hall of Silence) will feature beautifully carved white marble similar to the above image.